The relationship between the creatinine kinase cardiac isoenzyme concentration and total creatinine kinase concentration (CKMB/CK) has been recognized as an useful method of cardiac ischemia assessment. This analysis can be performed in certain time intervals and should be reviewed retrospectively in relation to the ST analysis. The aim of the study was to assess the realtionship between ST two-leads analysis and CKMB/CK index in fifty patients, scheduled for the coronary bypass surgery. We have chosen for analysis the deepest ST depression, and noted its duration time. Blood for CKMB and CK concentration was taken at 6, 12 and 36 hours after surgery. In nineteen patients the ST depression was noted, usually during first six hours after surgery. Its maximum depth was 4.7 mm and maximum duration time 126 minutes (mean 97 minutes). The CKMB/CK index larger than 1:10 was found in ten patients. There was no correlation between ECG and biochemical data. The only positive correlation (r=0.67) was found between the ST depression exceeding 1 mm and 12 hours-delayed CMKB/ CK index larger than 1:10. Key words: creatinine kinase, S-T-analysis, bypass surgery. Stabilisation of the lowered ST segment together with an increased CKMB/CK ratio facilitates the differential diagnosis between transient ischaemia and myocardial infarction. In patients with proven coronary artery stenosis, the ineffective attempts of pharmacological treatment provide an indication for bypass surgery. Good results of this therapy caused widening of indications for surgery in coronary heart disease. Nowadays also the patients with increased operative risk are included: elderly persons, patients with widespread atheromatic vascular changes or lowered ejection fraction values. Myocardial ischaemia is a frequent complication in the perioperative period. Its diagnosis involves enzymatic activity testing, among which the ratio of MB-isoenzyme of creatinine kinase (CKMB) to the total creatinine kinase (CK) activity in serum is routinely used. As enzymatic tests become positive with a certain latency to the myocardial ischaemic episode, methods of "on-line" monitoring are being searched for. One of these methods is a continuous analysis of the ST segment deviation in ECG tracing. The lowering of ST by 1mm (i.e. 0.1 mV), parallel or downward oblique to the baseline, lasting more than 0.08 s in subsequent cardiac evolutions, is suggestive of myocardial ischaemia. The aim of the present study was to assess the usefulness of ST segment monitoring and its correlation with CKMB/CK activity in the diagnosis of myocardial ischaemia in patients after coronary artery bypass graft. correlation of the results with clinical condition of the patient. 1. ST segment analysis during continuous ECG monitoring. The ST segment and enzymatic blood tests were evaluated 6, 12 and 36 hours after the operation. With time, the number of patients presenting symptoms of myocardial ischaemia gradually diminished (Fig. 1). The maximum depression of the ST segment was noted 6 hours after surgery (4,7 mm) but its duration was equally long in the immediate postoperative period and between 6th and 12th postoperative hours (range: 0-360, mean 97 minutes). From this time onwards, ST depression was similar in value, but lasted less time (range: 0-84, mean: 27 minutes) (Fig. 2). At repeated enzymatic assays (6, 12 and 36 hours after surgery) the number of patients with elevated CKMB/CK activity ratio gradually diminished (Tab. II). The increased ratio was most frequently observed in the immediate postoperative period, until the 6th postoperative hour. No correlation was found between the ST segment deviation (value and duration) and CKMB/CK activity ratio (correlation factor r = 0.34) in corresponding time intervals (Fig. 3). A positive correlation (r = 0.67) was documented between the duration of ST depression and CKMB/CK value 24 hours after surgery (Fig. 4). Neither clinical signs nor symptoms of myocardial infarction were present in any patient, which was confirmed by later diagnostic tests. Fig. 1. Duration of ST depression> 1 mm and rate of CKMB/CK incidence> 1/10. Fig. 2. The duration and value of ST segment depression. Fig. 3. 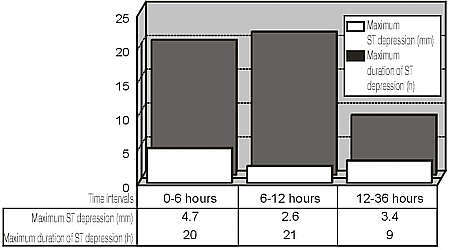 Correlation between ST depression during the first 12 postoperative hours and CKMB/CK ratio 12 hours after surgery. Fig. 4. Correlation between ST depression during the first 12 postoperative hours and CKMB/CK ratio 36 hours after surgery. Monitoring of possible myocardial ischaemia in patients after cardiac surgery should provide the continuous "on-line" information, be simple and possibly noninvasive, and should not interfere with postoperative nursing and physiotherapy. ECG monitoring is a widely accepted method (both specific and sensitive), although it can give erroneous results, especially in the postoperative period. Jain et al. list the possible causes of ST segment depression, not depending on myocardial ischaemia. These include: left ventricular hypertrophy, conduction disorders or late postinfarction scars. They can also depend on the action of the drugs, especially Digitalis preparations. Sudden ST depression may also result from the change of body position . Ansley et al. in their paper on different ECG monitoring devices, stated that false positive results in detection of myocardial ischaemia occur up to 26% [2, 3]. On the other hand, ischaemia in the areas of the myocardium not monitored by electrodes may not be detected by this method alone. This is why the need arises to employ sufficient number of electrodes, which would cover the maximum area of the myocardium. At the same time, their placement should be guided by preoperative coronarography findings. Hougue et al. found, that different patterns of coronary artery narrowing influence the ECG tracing. In comparative analysis we used the enzymatic protein, widely engaged in metabolic processes: creatinine kinase (CK). In humans it exists in specific isoforms, differentiated by electrophoresis: MM, BB and MB. The activity of different isoenzymes increases as the result of their liberation from damaged muscle tissue, both skeletal muscles and myocardium (MM and MB isoforms) [5,10]. The overall activity of CK in the blood depends on the mass of the damaged muscle tissue. Schwartz et al. demonstrated, that in patients with trauma to the skeletal muscles the activity of CK rises proportionally to CKMB. On the basis of this observation it can be stated that in patients with suspected myocardial ischaemia following cardiac surgery and extracorporeal circulation, CKMB activity value must be interpreted together with the CK level . According to the referred paper, trauma to skeletal muscles results in the increase of overall CK activity, lasting 24 hours. This, in turn, provokes the increase of MB isoenzyme activity to the values accepted as diagnostic for myocardial infarction. The CKMB/CK ratio, however, is in these cases lower than 1/10 . The activity of MB isoenzyme in plasma, in the immediate postoperative period, is usually interpreted as the result of myocardial damage. It should be remembered, however, that extracorporeal circulation and hypothermia may cause the increase in the cellular membranes permeability [9,12,13], which may influence the activity of this isoenzyme in the early postoperative period. During the next hours, the proportion of MB cardiac isoenzyme in the overall CK activity diminishes; isoforms liberated from damaged skeletal muscles (MM and MB) become more active [7, 10]. An increased CKMB/CK ratio persisting longer than 12 hours after surgery may suggest myocardial ischaemia or infarction, which occurred during the operation. The diagnostic sensitivity of CKMB/CK ratio was assessed by Pervaiz et al. at 84% during the first postoperative hours, and at 100% from the 12th hour onwards [8,17]. Stabilization of previously depressed ST segment may be the deciding argument in a differential diagnosis between transient myocardial ischaemia and infarction in progress. Data on the peak activity time of CKMB in the postoperative period differ [7, 10, 11, 14, 15]. When no myocardial infarction occurs the peak is observed in the early postoperative hours; in the opposite situation it is delayed. The clinical picture and circulatory system function are not decisive for the assessment of myocardial vascularisation in the postoperative period. Cardiac complications may occur postoperatively in any of these patients, independent of possible myocardial ischaemia. These can be arrhythmias and haemodynamic disturbances, including low cardiac output. Cunnigham , on the basis of literature meta-analysis, stated that cardiovascular disturbances may be caused by postoperative pain and emotional stress. Cardiovascular disorders, together with changes in ECG and enzymatic tests should evoke the suspicion of myocardial ischaemia. The persistence of these findings may suggest myocardial infarction. Normalisation of ECG readings and enzyme activity may prove that the treatment chosen was correct. 4. Continuous ST monitoring enables early detection of myocardial ischaemia and institution of proper treatment. Originally published in Anestezjologia Intensywna Terapia 31; (4), 237-240, 1999. Selective bronchial suctioning in the intubated neonate: how selective is it?